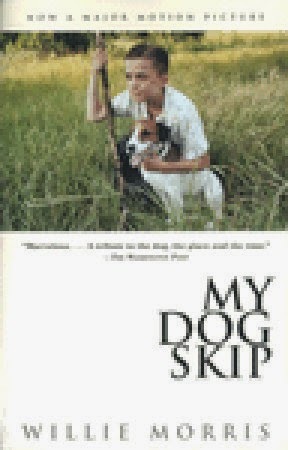 This is a sweet, gentle memoir of a boy and his dog, growing up in 1940s rural Mississippi. Willie's parents get a fox terrier puppy when Willie is nine, and Willie and Skip quickly become best friends. In an earlier time and in a small town where everyone knows everyone, they're free to roam all day during the summer months, with friends and on their own, having adventures and playing pranks that sixty years later, would not be tolerated. There is no plot here. There isn't supposed to be a plot. Morris simply reminisces about his dog and his friends, in no particular chronological order. They play football (Skip too! ), have chinaberry wars, and make silly bets, such as Willie and Skip spending a night in the cemetery. Kids started driving the family car early, and Willie teaches Skip to sit with his paws on the wheel, so that at opportune moments Willie can duck out of sight and make it look like Skip is driving. They (Willie and Skip) travel on the bus to see Willie's grandparents, attend Boy Scout camp, and do any number of other things you'd be hard pressed to get permission to include your dog in today. It's not really true that the 1940s were a simpler time; there was a world war, and a host of social issues, almost entirely un-noted in this book, that were about to boil to the surface. It was a different time, though, and childhood was in some respects freer and less complicated. Morris does a wonderful job of capturing that feeling of innocence and freedom, and childhood adventures and pranks that were still possible in my own childhood in the fifties and sixties, but are largely gone from childhood now. The language is rich and beautiful, too, though perhaps a bit challenging for the children likely to be pointed at this book because it's about a child and a dog. This is more intended for those of us who remember our own childhoods, than for those still experiencing theirs.